Texas State Genealogical Society (TxSGS) has announced the conference schedule for San Antonio on 2-4 November 2018. This year celebrates 300 years of history since the founding of San Antonio with three days (and over 3,000 minutes) of great genealogy education! Registration is available at http://www.txsgs.org/txsgs-2018-conference-registration/. Lodging and venue information is available at http://www.txsgs.org/2018-conference-lodging-and-venue/. Nearby restaurant information is available at http://www.txsgs.org/2018-conference-restaurants/. Note that lunches are not available through the conference this year. The conference schedule details and list of sessions are available at http://www.txsgs.org/2018-txsgs-schedule-overview/. Exciting sessions start at 9:30 a.m. on Friday and run through 4:30 p.m. on Sunday. If you are like me and need the conference schedule in a grid format to make your session choices you can use the grid I created at http://debbiewayne.com/temp/Txsgs_2018_schedule_grid.pdf. This year I will be presenting a two-hour workshop on autosomal DNA analysis from 1:30 to 3:30 Friday afternoon. This workshop has limited seating available and an add-on cost of $30. I will be presenting "Organizing Genetic Genealogy" at 11:00 on Saturday and "Documenting DNA Analysis" at 2:00 on Saturday. I am scheduled before and after lunch; it will be a busy mid-day on Saturday. Our plan is to unveil our new Early Texas DNA Project website at this conference. I will be answering questions and featuring the website at a TxSGS booth when I am not speaking. Speakers include Mic Barnette, Jim Brewster, Evan Christensen, Schelly Talalay Dardashti, Debra Dudek, Mary Esther Escobedo, Patti Gillespie, Sharon Gillins, Sara Gredler, Colleen Greene, Tony Hanson, Kevin Klaus, Devon Noel Lee, Janice Lovelace, Bernard N. Meisner, Kelvin Meyers, Betsy Mills, Laurel Neuman, David Passman, Lisa Reed, Diane L. Richard, Mary Kircher Roddy, Lisa Toth Salinas, Carl Smith, Kathy Strauss, Michael L. Strauss, Pam Vestal, Eric Wells, and Ari Wilkins. Normal sessions include diverse topics with research tips on African Americans, DNA, Germans, Hispanics, land, methodology, military, publishing and preservation, records and repositories, Russian Jewish immigrants, and technology. Workshops include Autosomal DNA Analysis, Metadata and Digital Archiving Your Family History Photos and Documents, Researching Your World War II Ancestors, and Spreadsheets 101—An Excel-lent Hands-on Tutorial. There is something for every researcher at every knowledge level. I hope to see you there. Debbie Parker Wayne will receive remuneration as a speaker for this conference and is a board member as the DNA Project Chair. Debbie Parker Wayne, "Texas State GS 2018 Annual Conference Schedule," Deb's Delvings, 30 July 2018 (http://debsdelvings.blogspot.com/ : accessed [date]). More people are jumping into DNA testing and genetic genealogy who are not experienced in DNA or genealogy before taking that first DNA test. Joining a social media group or a mail list or forum provides exposure to many programs and tools, terms, and techniques that make it seem like a fire hose is aimed at you at full blast. It is great to jump in. It is great to ask questions to learn. But you never know how much the person answering you knows. And they may not even know they are giving you information that is not completely accurate because they misunderstood your question. Below are some places to (1) learn more about DNA and (2) get better help when one of the DNA tools does not work as you expected. Salt Lake Institute of Genealogy (SLIG) in the U.S.
Start small when learning something new and build up to higher levels. 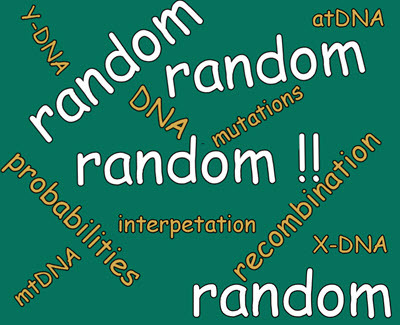 This applies to studying DNA using the recommendations above and to learning new tools. When learning a new tool or process test first with a small dataset. 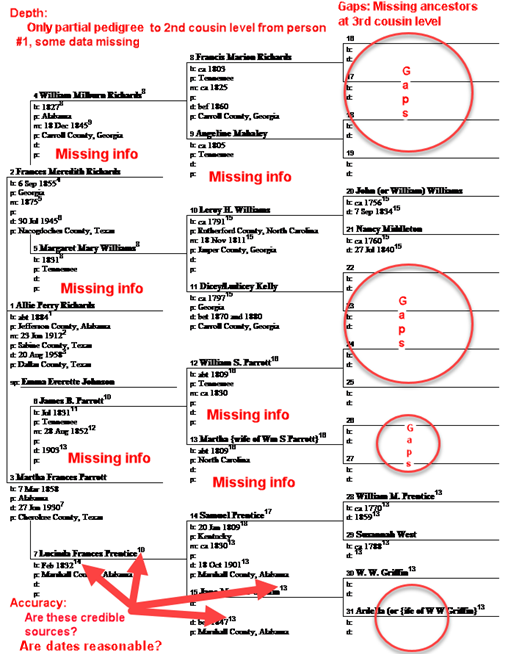 For example, when I first downloaded the version of Progeny Charting Companion that creates DNA analysis charts, I created a small RootsMagic database with only four DNA test takers and the direct lines back to their shared ancestors (as shown in the chart above). I created a dummy CSV file with the minimum amount of data needed for those test takers' DNA data (as defined in the Charting Companion's help files). I used this small dataset to play with the charts offered by Charting Companion until I understood how the options worked to get the output I desired. Once I was comfortable using the tool I then accessed my full RootsMagic database after adding the new facts needed for DNA charts to work properly (like DNA kit numbers for each test taker). 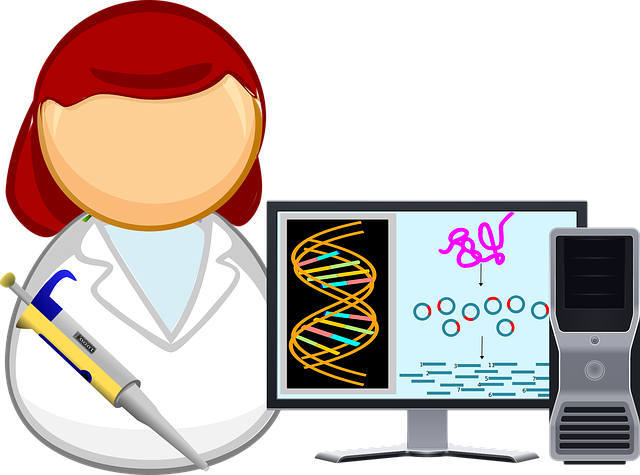 the error message received or exactly what you saw that was not "right"
These recommendations should help you get better technical support and help you learn new programs and DNA analysis more productively. Update 23 July 2018: Fixed minor typo, added NGS online training courses, and added to disclaimer royalties for courses and books. Debbie Parker Wayne receives royalties for the NGS course she authored on autosomal DNA analysis and books for which she is an author or editor. 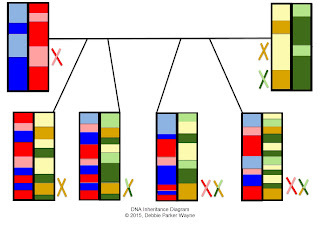 Debbie Parker Wayne, "Learning DNA and Getting Help with Analysis Tools," Deb's Delvings, 21 July 2018 (http://debsdelvings.blogspot.com/ : accessed [date]). Pierre Clouthier, president of Progeny Genealogy, has been raising the bar for DNA analysis charts in a genealogy program for the last year or so. 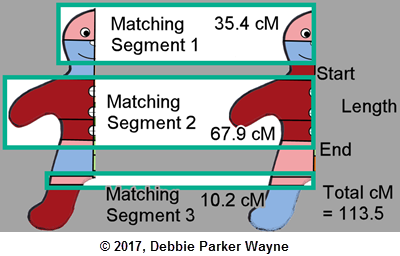 He was the first to automate the "McGuire Chart" in his "DNA Matrix" tools. 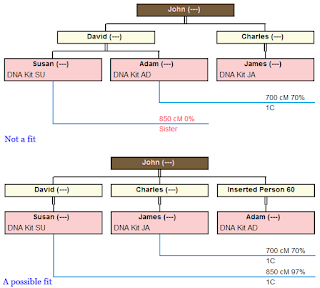 See http://debsdelvings.blogspot.com/2017/03/wanted-genetic-genealogy-analysis-tools.html and http://debsdelvings.blogspot.com/2017/06/one-dna-analysis-chart-process.html for more info. 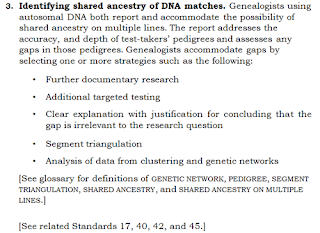 Progeny just released Charting Companion version 7 with a major addition to help during DNA analysis as described in his announcement below (URLs were changed to go directly to the Progeny website and not to the advertising site in the email sent to me so as not to mess with stats from email accesses). 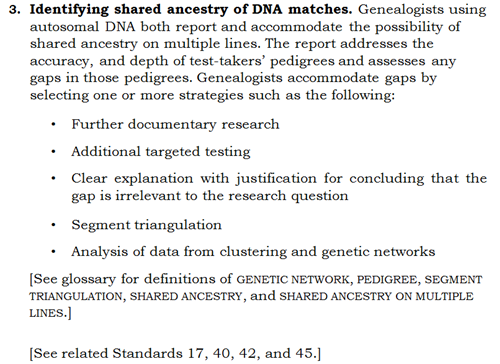 Charting Companion 7 features a new technology to help place adoptees and orphans in a family tree: the DNA Simulation. Based on the DNA Matrix, the DNA Simulation will construct a Descendant tree, then will systematically try to link the "orphan" to every person in the tree, one at a time. Charting Companion will validate the tree by calculating the expected centiMorgan (cM) implied by the hypothetical relationship, and comparing it to the actual laboratory DNA test results. Each iteration is called a "scenario". If the DNA test results are outside the cM range, the scenario is bad, will be discarded, and Charting Companion will advance to the next possible position of the orphan in the tree. If the DNA results are consistent, the good scenario will be recorded. All possible scenarios can then be reviewed for further investigation. (see video [at https://youtu.be/yBe6Pd8g5no]). In addition to linking to existing persons, Charting Companion will also insert hypothetical or placeholder spouses and children, and attempt to link the orphan to these additional people. The added persons represent potential extramarital relationships, previous unknown marriages, unknown children, children given up to adoption, non-paternal events, etc. They are meant to suggest possible connections that would otherwise be very time-consuming to evaluate manually. 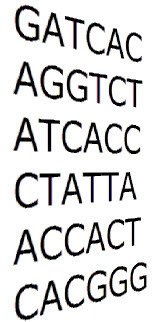 The DNA Simulation is available in Charting Companion 7. See video [at https://youtu.be/yBe6Pd8g5no] for detailed explanation. If you purchased within the last year, you get a free upgrade (contact [Progeny]). If you purchased within two years, you get a 20% discount (contact [Progeny]). 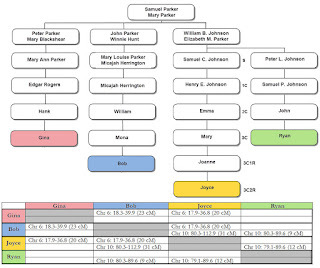 Within three years, purchase a Registration Key [at http://progenygenealogy.com/Products/Family-Tree-Charts]. 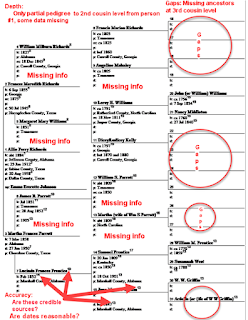 Charting Companion works with all genealogy programs: Family Tree Maker, RootsMagic, Legacy, Ancestral Quest, Family Historian, GEDCOM, etc. Debbie Parker Wayne, "DNA Simulation added to DNA Matrix in Progeny Charting Companion," Deb's Delvings, 21 July 2018 (http://debsdelvings.blogspot.com/ : accessed [date]). 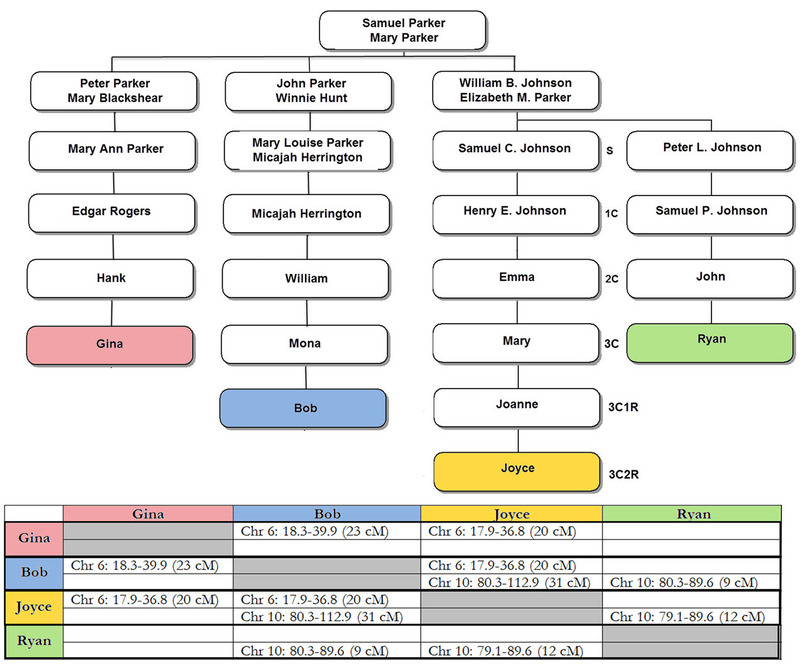 John Motzi has developed an Excel X-DNA Inheritance Chart that includes only the ancestors who may have contributed to the X chromosome of a person. I have made this chart available on my website with John's permission. The Excel file can be accessed directly at http://debbiewayne.com/presentations/dna/MotziJohn_Xinheritance_Ancestry_Chart.xlsx. 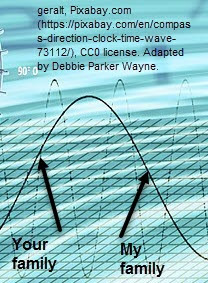 There is also a link available from my QuickRef Links section at http://debbiewayne.com/pubs.php#quickref once you scroll down to the section with links to "Charts for X-DNA analysis by others." You can find John's email address there also if you wish to contact him about the chart. Because the names of ancestors who could not have contributed to the X chromosome are eliminated, this may make more sense to some of us and make it easier to find common ancestors on the X lines. While my versions of the charts make sense to me, some of you may prefer John's version of the charts or the ones created by others that are also linked in my Quickref section. All of us think a little differently and the same tool is not best for all. Try this out and see if it works better for you. 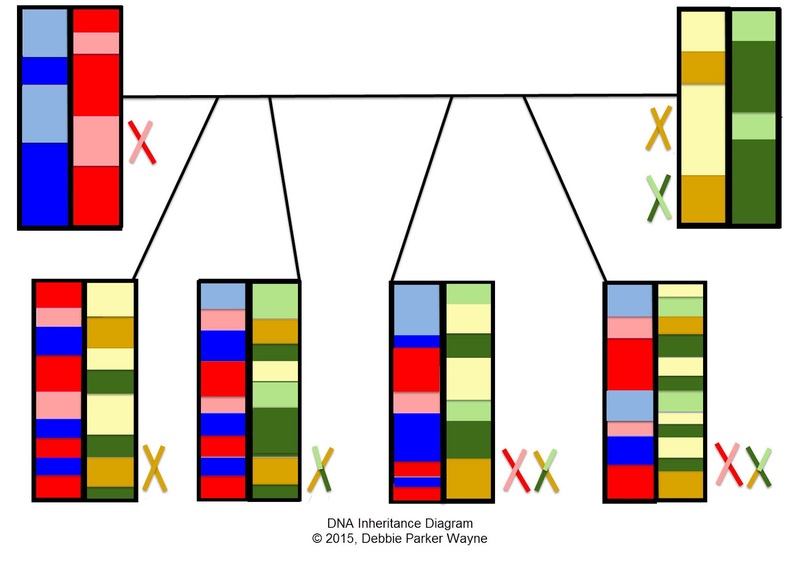 Debbie Parker Wayne, "A Different X-DNA Inheritance Chart," Deb's Delvings, 4 January 2018 (http://debsdelvings.blogspot.com/ : accessed [date]). A prestigious journal has an interesting article on access by individuals to his or her own genomic data. It may help fight the recent rash of news articles generating fear of DNA testing due to companies using our data for research. Barbara J. Evans, "HIPAA’s Individual Right of Access to Genomic Data: Reconciling Safety and Civil Rights," The American Journal of Human Genetics, Volume 102, Issue 1, 5-10; DOI: http://dx.doi.org/10.1016/j.ajhg.2017.12.004. 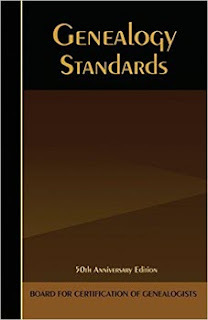 While the focus is on US laws and organizations, many of the general statements apply worldwide. Articles like this emphasize the importance of educating ourselves about the interpretation and meaning of DNA markers and our genes. We need to fight the perception that most of us will "make bad decisions that harm both [ourselves] and society" if we have access to our DNA data. DNA education through teaching and writing has been my main focus in recent years. So many social media users seem to use posts as their main learning tool nowadays. It would be great if those answering questions included pointers to reputable resources where the person can learn more. Education is key to eliminating the perception that we are all dummies when it comes to DNA. 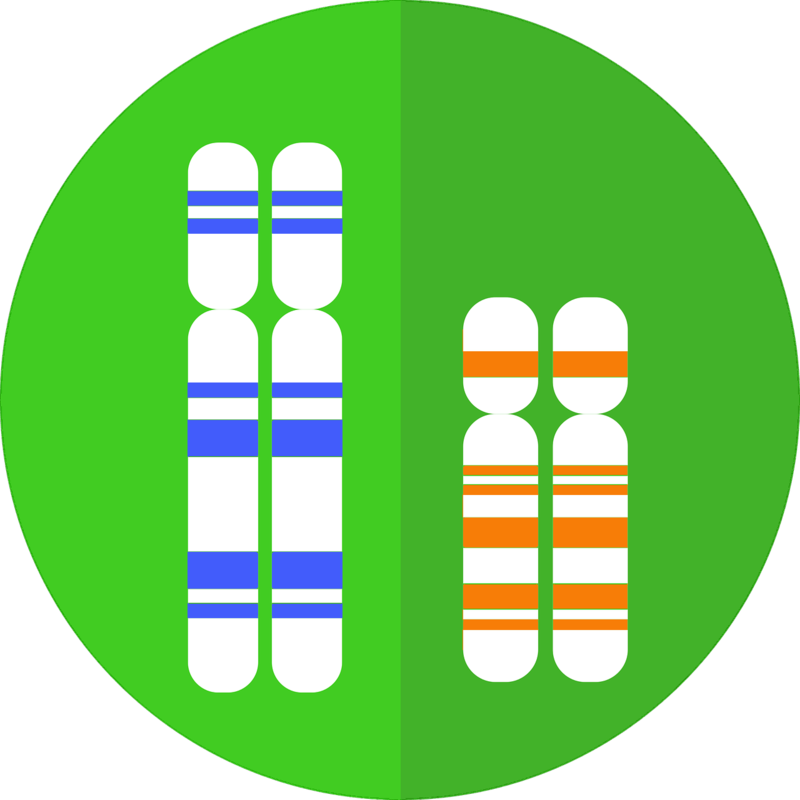 Links to genetic genealogy articles and educational opportunities can be found here on my DNA bibliography which is updated as I learn of new resources. Although there are a range of bioethical perspectives on this question, there is a fairly broad consensus within the bioethics community that laypeople can be harmed by access to subclinical-quality genomic data. A large cast of third parties potentially has access to your whole genome, while ethicists debate whether it is “information” you should have. Like the right to vote, access to one’s own genomic data is a foundational civil right that empowers people to protect all their other civil rights, and HIPAA displaced states’ power to interfere with it. 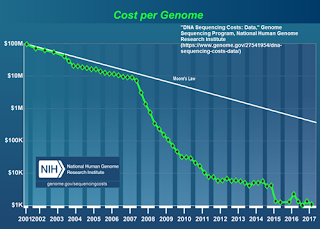 To cite this blog post: Debbie Parker Wayne, "Educating Ourselves and Protecting Our Right to Access DNA Data," Deb's Delvings, 4 January 2018 (http://debsdelvings.blogspot.com/ : accessed [date]).